Physical activity is essential to a healthy lifestyle. Unfortunately, many people with vision loss face barriers when it comes to exercise. Running, for example, is often restricted to a treadmill. Or, these runners require the assistance of a human guide. Both of these are excellent options, but some athletes desire more freedom in their daily exercise regimens. Guiding Eyes for the Blind in New York, USA, has created a program that helps reduce these limitations for runners with vision loss. How? They have created a unique Running Guides program to train K9 companions to guide their handlers through public spaces at a running pace. 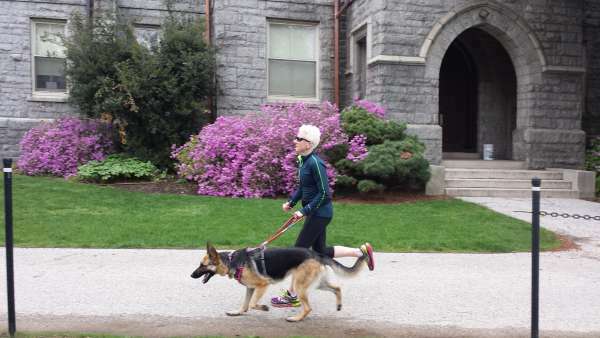 We spoke with Ben Cawley, Director of Admissions at Guiding Eyes for the Blind, about the Running Guides program and how it’s promoting independence in exercise for people who are blind or visually impaired. What got you into training guide dogs? From a young age, I always loved dogs. As I learned about dog training and researched careers, I was drawn to guide dog training because I wanted to work closely with people and dogs. How long have you been training guide dogs? Our CEO, Thomas Panek, is a marathon runner and guide dog user. He knew of guide dog users who were interested in running with their guide dogs and challenged us to create a program that would empower blind and visually impaired athletes to be able to run with their guide dogs. What are some of the challenges unique to teaching a guide dog to run with their partner? We needed to rethink the traditional guide dog harness to make them comfortable, ergonomic, and adjustable to fit good running form for both the handler and dog. Finding the right match in pace for the handler and dog can also be challenging, especially because we first match the team by their walking pace. [But now] we also need to consider their running paces when making matches. What are the dogs trained to deal with in terms of obstacles and real-life situations? Guide dogs are trained to avoid stationary and moving obstacles, to stop when there is not enough space for both the dog and handler to navigate, and to stop for changes in elevation such as stairs and curbs. Is every dog suitable for the running program? Our Guide Dog Mobility Instructors tell us when they feel they have a dog who would enjoy running; we are looking for dogs who like to be out front and will speed up when their partner picks up their pace. Some dogs aren’t interested in running and prefer to work at walking pace. Will a dog ever be capable of running a marathon? We find that most of our running guides are capable of running up to 10km distances. Some dogs, as they gain experience as runners, have shown that they are capable of running greater distances. Are there different care requirements for these dogs? Or different breeds that are better suited for this? We work with two breeds of dogs at Guiding Eyes for the Blind: Labrador Retrievers and German Shepherds. Both of these breeds are well suited to be running guide dogs. We recommend increasing food amounts on long distance running days, as well as incorporating additional opportunities for water breaks. What training must the runner complete to better facilitate the dog? In addition to learning how to work with their dog as a guide dog through one of our training programs, they participate in training runs during their initial training program. Once they return home, they must work to develop solid guide work as a team, and then we travel to them to complete their running training in their home area. What are the benefits to running outside vs. on a treadmill? Treadmills are great for training, as they allow for running no matter what the weather, lighting conditions, or time. Many of our graduates continue to use treadmills as part of their exercise regimen. Outdoor running is wonderful for the added benefit of being out in nature, sunshine, etc. I am personally more motivated to go on a run outdoors than on a treadmill and prefer outdoor running—and most runners that I know would agree! Our graduates tell us they appreciate being able to increase the amount of time they can run outdoors. Any stories you’d like to share about your experiences so far? One of our graduates is a coach for a high school cross country track team. The first time we worked with her and her dog, she picked up the harness handle of the running guides harness, dressed in her running clothes with a huge smile on her face. She turned to ask us how to [prompt] her dog to start running, “Do I just say forward, let’s run?” Before we could answer, her dog started running and they took off like they had been running together for years—it was so smooth! [As] her vision deteriorated throughout the years, she had to give up running and she wasn’t able to run with the team that she coached. Through Guiding Eyes’ Running Guides program, she is now able take her dog out with her track team and coach them while running alongside them. Being a part of empowering athletes who are blind and visually impaired to get out and run! Guiding Eyes’ Running Guides Program has exposed me to so many amazing athletes. You can learn more about Guiding Eyes’ Running Guides program on their website. Want to learn more about how guide dogs are supporting people with vision loss? Read our blogs about Canada’s guide dog programs for youth and how puppies transform into guide dogs.